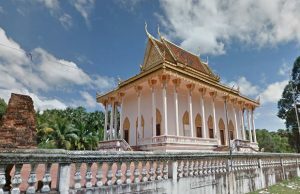 Prasat Kuhak Nokor is located in Trodork Poung Village, Pong Ror Commune, Baray District, Kampong Thom Province and is in the complex of Wat Kuhak Nokor (Buddhist Pagoda). 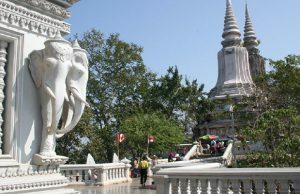 To reach there, passenger can take all kinds of vehicle on National Road 6, then turn west through the gate of Kuhak Nokor pagoda in a distance of 2km. 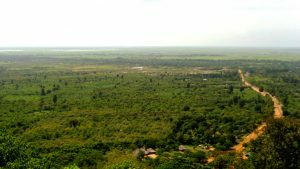 It is 79km from Provincial Town of Kampong Thom. These sanctuaries were built on the flat ground, on a square terrace made of laterite and sandstone facing to the East with the rampart surrounding. This rampart has a 35m-length (East to West) and a 25m-width (North to South). There is surrounding rampart of one meter height and 0.8 meter thick with two gateways: Eastern gateway is 9m height divided into 3 rooms, and western gateway is small and has square shape. The structures of the buildings are mixed, made of laterite and the decoration of sandstone. East of the temple, there are 2 ponds-the small one has about one-meter depth,45-meter length and 20-meter width, and the big one has 160-meter length, 88-meter width and more than one-meter depth. 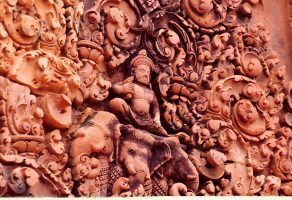 Prasat Kuhak Nokor comprises: - The throne is square shape, made of sandstone and decorated by lotus flowers and pointed-diamond style, and has square hole at the middle. - A male standing statue remains from thigh to shoulder. - A male standing statue remains from thigh to the navel. - A male coiling statue is difficult to be identified as the statue broke the end of the arm and the sole of the foot (local people called the statue ?Neak Ta Bark Kor?. Prasat Kuhak Nokor was built in 10th -11th century by the king Suryavarman I (1002-1050). But in the same year (1002), another document said there was a king named Preah Bat Jayviravarman who who was also on throne (1002-1010). The two kings claimed that they were on throne at the same year, this leading to war between king and king until 1006. Then the king Suryavarman I conquered Yasodharpura city, however the war still lasted for 04 years to end. In 1010, the king Suryavarman I gained success over the entire territory and had full power in the country.